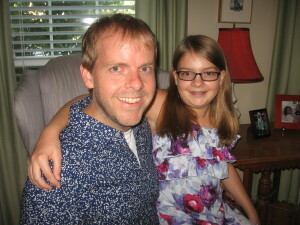 Our oldest daughter, Claire, turns 13 tomorrow. To celebrate I took her out for a special Father-Daughter date last night where I gave her a promise ring. But it’s not your normal promise ring as you will see from the letter I share with you below. For the ladies, I pray you’ll hear your Heavenly Father make these promises to you. For the gentlemen, may these words inspire you to treat every young lady like a Sister in the Lord – they have a Heavenly Father to whom you will answer. For the wise individual looking for the right life partner, may you seek all the Godly counsel you can from wise mentors. To your mother and me, you are a precious treasure beyond description. So precious, this promise ring represents not promises I’m asking you to make to me, but ones I am making to you. And I make this commitment with all the love and power Your Heavenly Father has granted me as your earthly Father. First, I personally promise to you that I will keep the vows I made to your mother, setting an example of the kind of man you would want for a husband. I further promise to prioritize my family over all, but my commitment to God (knowing God’s purposes for my life are not in conflict). Marriage is an awesome calling. Therefore, I promise to guide you in understanding and accepting the mystery of marriage as described in God’s word, so you will be ready for a life-giving, life-long marriage. Marriage requires sober preparation. Therefore, I promise to help you prepare for the demands and blessings of marriage, so that you’ll be equipped to respect, serve and minister to your future husband. Marriage requires divine inspiration. Therefore, I promise to disciple you in faith, wisdom and grace, so that you will be empowered to discern God’s will in all your major decisions and significant relationships. Finally remember, you were created not for the pleasure of any man, but for the pleasure of your Heavenly Father. Therefore, until God calls you into marriage, I promise to lead you in living each day with passion and purpose, as you anticipate the glorious day of your ultimate union with Him. Your mom and I could not have imagined the exceptional young lady you have already become and we look forward to witnessing your continued growth into the mature woman God is calling you to be. When you look at this ring, remember your Mom and I love you unconditionally and believe you can do all things in Christ. Remember my promises to you. And, remember to love the Lord Your God with all of your heart (worshiping Him alone), all of your soul (abiding in God’s love), all of your mind (treasuring truth and wisdom) and all of your strength (cherishing life). Then you will be empowered to love others as you love yourself, blessing Your God, yourself and everyone whose life you touch.